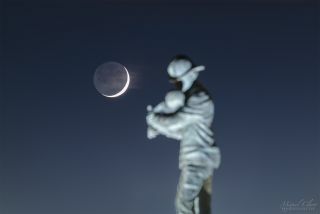 This photo of a crescent moon setting with an earthshine visible, next to a sculpture of a firefighter, pays homage to firefighters. Captured in Reguengos de Monsaraz, Dark Sky at the Alqueva Reserve, in Portugal. Miguel Claro is a Lisbon, Portugal-based professional photographer, author and science communicator who creates spectacular images of the night sky. As a European Southern Observatory photo ambassador, a member of The World At Night and the official astrophotographer of the Dark Sky Alqueva Reserve, he specializes in astronomical "skyscapes" that connect Earth and the night sky. Join him here as he takes us through his photograph "A Baby Moon Is Shining and Heating." A tiny sliver of the waxing moon grows larger and brighter, slowly heating up as the moon's surface reflects more and more sunlight. The sunlit side of the moon can reach temperatures of up to 260 degrees Fahrenheit (127 degrees Celsius). Meanwhile, on the "dark side" of the moon, temperatures can dip to minus 243 degrees F (minus 153 degrees C). The sculpture seen in the foreground of the image was made by two Portuguese sculptors known as the Charneca brothers. It was erected in the town of Reguengos de Monsaraz, where Portugal's Dark Sky Alqueva Reserve is located, to honor the local fire department on its 75th anniversary in 2010. To see more of Claro's amazing astrophotography, visit his website, miguelclaro.com.